Compactor/drivers combine high frequency vibration with high impact power to make quick work of any compaction or driving task. 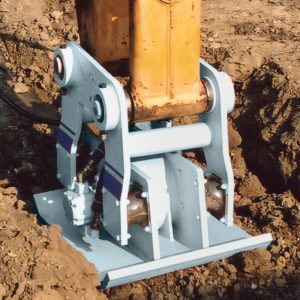 Designed for use on medium and large excavators, these compactors are designed to work anywhere a boom can reach in trenches, around foundations, on slopes or seawalls. Hydra-Paks can safely compact trenches, often eliminating the extra cost involved with a man and walk-behind unit and the added expense of trench boxes or shoring. The Hydra-Paks are also ideal for driving steel sheeting used for retaining walls. Furukawa compactor/drivers feature special rubber shock absorbers which protect the boom by isolating it from the Hydra-Pak vibrations and a cross-over check valve protects the motor. HP135 II delivers 13,500 lbs. of impulse force and the HP210 Ft II delivers 21,00 lbs. of impulse force at 2000 cycles per minute assuring maximum lift capacity. All units are built for rugged, reliable performance with hardened steel components to resist the effects of stress, vibration, fatigue and impact forces. Rubber shocks absorb vibration protecting the carriers boom. Models 135 and 210 FB II are available with our unique floating boss design that allows O.E.M. pin spacing, eliminating costly manufacturers brackets. Pin Spacing In. (mm) 15.75 (400) O.E.M. O.E.M. Pin Spacing In. (mm) 18.7 (475) O.E.M. O.E.M.